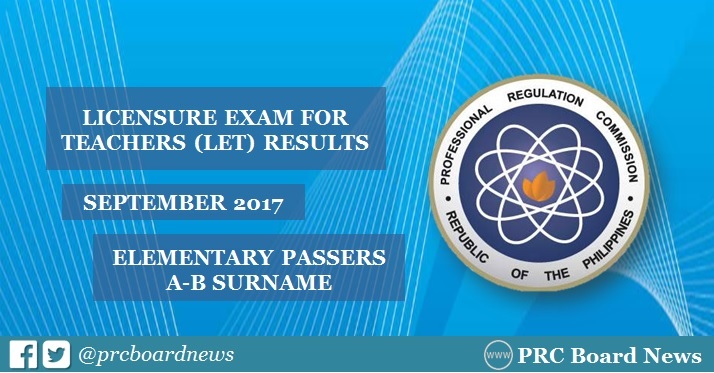 MANILA, Philippines — The Professional Regulation Commission (PRC) and the Board for Professional Teachers (BPT) officially released the results of September 2017 Licensure Examination for Teachers (LET) on Monday, November 27, 2017. The alphabetical list of passers (A-B Surnames) is now available on this page. PRC named the new licensed Elementary level teachers who have successfully hurdled the September 24, 2017 LET, which was conducted in at least 27 testing centers nationwide: Baguio, Bacolod, Cagayan de Oro (CDO), Catarman (Northern Samar), Cebu, Davao, General Santos, Iloilo, Laoag, Legaspi, Lucena, Manila, Rosales (Pangasinan), Tacloban, Tuguegarao, Pagadian, Zamboanga, Mamburao, Occidental Mindoro; Calapan City, Oriental Mindoro; Odiongan, Romblon; Kidapawan Cotabato, Boac, Marinduque; Virac, Catanduanes; Puerto Princesa City, Palawaan and Masbate City. PRC and the Board of Professional Teachers said that in order to pass the September 2017 LET, an examinee must obtain an average rating of not less than 75% and must have no rating lower than 50% in any of the tests. According to PRC Resolution No. 2016-1019, which deals with the 'Schedule of Licensure Examinations for Year 2017, the target release date of September 2017 LET board exam results is on Monday, November 27 or in 43 working days after the exam. Note: Government work in NCR was called off on October 16 and 17 due to nationwide transport strike and on November 13 to 15 due to ASEAN Summit and Related Meetings. In the same period last year, results were released online in 48 working days after the exam. A total of 23,378 elementary teachers out of 77,466 examinees (30.18%) and 31,334 secondary teachers out of 92,754 examinees (33.78%) successfully passed the exams. In the September 2015 LET, results were also out online in 48 working days. A total of 21,461 elementary teachers out of 68,442 examinees (31.36%) and 34,010 secondary teachers out of 81,463 examinees (41.75%) successfully hurdled the exams.